This past weekend, much like the last few, we have been going through mom’s stuff that she and dad had put in storage at least 6 years ago. For the most part it has not been that emotional for me. My parents bought storage rooms. You know like the guys on Storage Wars. So a lot of the stuff they have doesn’t have a sentimental value tied to it. It is actually making it easier to go through. One of the exceptions is her safe, she didn’t have a lot of worldly possessions in her safe mostly papers, some marbles my Papa had given her as a child, stuff like that. 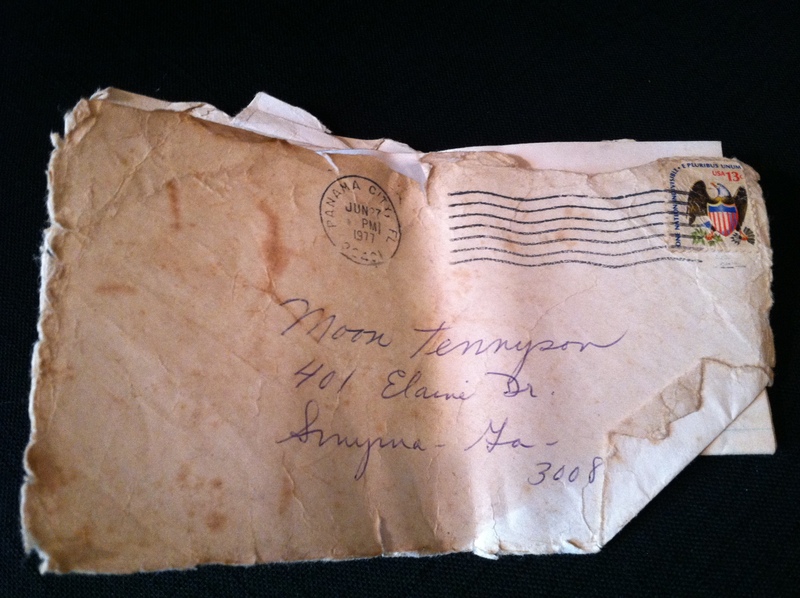 One of the papers in her safe was a letter that my Papa had written my baby brother before he was even born. A little bit of history: my Papa wanted to name my brother Moon. My parents gave him a resounding NO. But he kept on pestering. Dad’s parents picked nice Irish names and mom and dad were going with those. But my Papa, with Indian blood flowing through him stood strong and kept insisting that his Grandson’s name was going to be Moon. It wasn’t until my mom and dad got the letter, addressed to Moon, that they changed their minds and knew this child coming would have to have Moon in his name. My mom saved the letter and I found it in the safe. Even though it is too my brother, it is all about my mom. It is a beautiful letter written by a Daddy that loved her so much his heart must have exploded. I know how that feels with my little one. This will probably be the first letter you receive in this great world. I just wanted to be one of the first to welcome you. Moon, I want to tell you a few things about one of the greatest person in the world, she is your mother, Carlotta (I have left out her full name but Papa wrote it here). I have known her all her life and very few people could mean as much to me as she does. I remember from the day she was born she was not too cute but she was my black head a very good baby with big eyes and a loving heart. And she has never lost that loving heart. She was at my heels from the time she could walk until she got married. I could never milk a cow, feed a pig, work in the garden, or do anything that she was not there and she always helped me whatever I was doing. Sometimes I wish I could keep her that way, a little child, but the Lord bless me and let her grow up into the finest person in the world. She will always be that little girl to me. I love her so much. I remember when she would let me milk Su pet milk right in her mouth. Ride Friedman(?) the bull, feed the hogs. She was always doing something. She never shucks her duties in fact she does more than her share of work. May it be easy or hard she never complains. She did a lot of her sister and brothers jobs too. You could never ask her where anything was that she just couldn’t go and put her hands right on it. I remember one day when she was about 4 years old. We were riding along and she saw a house painted yellow. She said “Daddy get some yellow wood and build us a yellow house.” She did not have a lot as she grew up but one thing she had enough of was pink dresses. At one time she had 11 pink dresses. She was so pretty in pink. She followed me everywhere I went. She would go to work with me and stay all day, help when she could. Go with me shopping, just anywhere she could be with me. She was a daddy’s girl. I miss those great times. But those memories will linger as long as there is life in my body and in eternity we will be together again. Moon, I could go on and write for weeks or even years telling you what a fine person your mother is and how much she means to my life. I love her so much. But I won’t write on and on, I will just wait and let you see some of these nice things in your mother for yourself as you grow up. If I never have a lot of material things in this world, I have something more precious, “Your Mother”. Moon, I will close now but remember I love you and sweet Shelly, also your father. Before I was a parent I would have never understood the extent of a love for your child. My Papa loved my Momma with great intensity. My mom was like this as an adult to. She was a loving loyal hard worker who never ever complained. Papa raised a good daughter and I am blessed that she was my mom. And just like one of his lines in his letter, Momma and Papa are now spending eternity together. Oh and needless to say my brother’s middle name is Moon! THAT LETTER WAS AWESOME LOVE MY CARLOTTA TOO SO MUCH . It was wasn’t it Sunshine!